Behold! Hong Kong Disneyland's latest attraction! 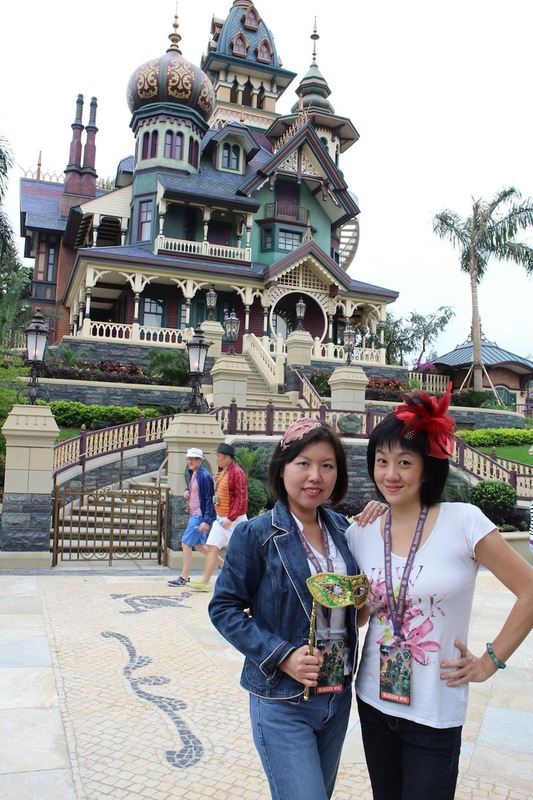 See the unusual and exotic looking Mystic Manor behind us? It's part of this new zone called Mystic Point which officially opened May 17, 2013. This area is located just beyond Grizzly Gulch. Mystic Manor is the home of eccentric explorer Lord Henry Mystic, showcasing all his art, antiquities and oddities. You'll get to board the Mystic Magneto-Electric Carriage for a tour of his private museum inside this Victorian manor house. There he is - Lord Henry and his companion monkey called Albert. Watch out for Albert who obviously will be up to mischief. Sorry for stereotyping monkeys, but...well, you'll see. So yes, you'll embark on a ride that's about five minutes long, with a soundtrack composed by Grammy and Emmy award winning Danny Elfman (also Oscar-nominated). OK, let me geek out for a minute here. The Mystic Magneto-Electric Carriage is trackless! It's the first trackless ride built by Disney that uses radio-frequency identification (RFID) technology. Four carriages depart at a time with up to six guests inside, gliding and swirling around like those teacup rides but with a lot more effects. It will take you through the various rooms of the manor. First up, you'll see lots of artifacts. And Albert opening up a magical music box, which releases enchanted Music Dust inside which brings things to life. The Music Dust travels through several rooms including one with musical instruments, a solarium, a Slavic-Nordic chamber, Egyptian antiquities, tribal arts, and a Chinese salon. Oh yeah. Surprises at every corner. Ultra-high-definition (4K) HD cinema projectors are used to create 40 types of special visual effects. The carriages rotate around, allowing all the guests to have a mobile theatre experience. The ribbon of mystical energy finally comes to a rest, after creating much havoc and drama. Outside, there is a Mystic Point Freight Depot, where Lord Henry's grandnephews share adventure stories with the guests. They have also invited friends they met along the way, as well as cultural ambassadors - Mexican, Indian, Native American, Egyptian and Bulgarian - to join them. Each of them gives a little performance. Also outdoors is the Garden of Wonders with ancient sculptures and mosaics with 3D illusions. You must view them from particular angles to unlock the mystery. Also, you'll get to create height-depth illusions. A person standing on the left block (much farther back) will appear smaller than someone on the right (front block). Much like how they made Gandalf look taller than the hobbits. And if all that activity makes you hungry, there's a 500-seater restaurant within Mystic Point offering cuisines from Indonesia, Japan, Korea and Southeast Asia. I really liked the Blueberry Myst drink, which has a special LED-lit acrylic cube amongst the real ice cubes. It just glows on you. Mystic Point is also the final expansion zone in Phase 1 development of the Hong Kong Disneyland Resort. There are more exciting plans afoot for Phase 2: Marvel Land! Comic book action heroes!